Monday, April 22nd is Earth Day. And this year’s theme is The Faces of Climate Change. People are encouraged to submit their own photos for inclusion in a grand mosaic, while telling their story of how climate change has affected their lives, and what they’re doing to help solve the problem. So, in keeping with that theme, we’re focusing today on a few individuals who clearly are contributing to the solution. 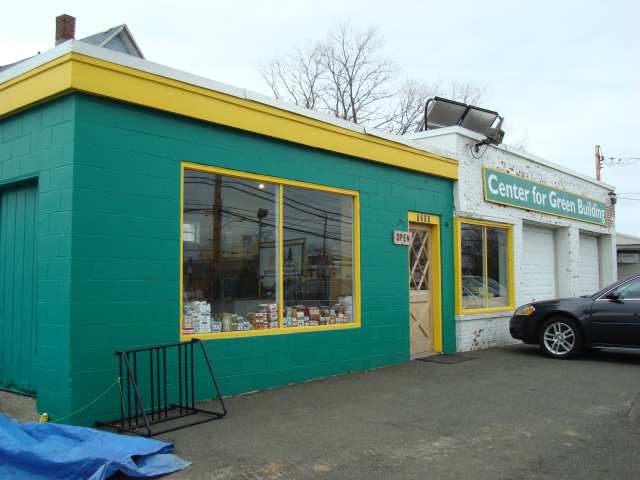 The Center for Green Building, located at 3309 Fairfield Avenue, in Bridgeport, Connecticut, is a building supply store dedicated to selling products that are completely non-toxic (both to install and to live with). These products are manufactured in environmentally responsible and sustainable ways. During Earth Week, I met with Gabriel Johnson, part-owner and Operations Manager of The Center for Green Building. I hoped to learn more about the history of their store, the products they sell, and their business philosophy. Local residents Erin Buckley and Jonathan Tuminski started The Center for Green Building in 2005. A carpenter by trade, Jonathan found himself developing sensitivities to certain building supplies he was working with. This motivated him to seek out less toxic alternatives. In time, Jonathan and Erin decided to establish a company to resell the same products they’d preferred themselves. And with that, the Center for Green Building launched. Gabriel then joined them shortly after earning his degree in business management and economics from Southern Connecticut State University (my own alma mater, I’m proud to say). Today, Erin and Jonathan still operate their original carpentry company, Measure for Measure, LLC, as a green building and remodeling firm. 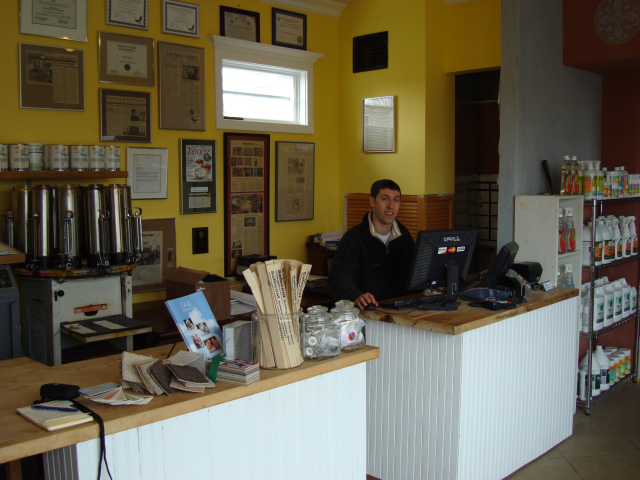 The Center for Green Building serves as the retail sales end of the business. I asked Gabriel how he would characterize The Center for Green Building’s customer base: “Many are homeowners who had previously experienced health issues with certain materials used in their homes, and simply require safer alternatives. Others have embraced green building philosophy, and want to use more sustainable supplies and materials in their home improvement projects”, he told me. “Also, a good many of our customers are DIYers, while some will send their contractors here with requests for specific products to use or install”, Gabriel added. Gabriel Johnson manning the front desk. On the wall behind him are many local business awards and accolades. As for the business end of things, Gabriel conceded that this is indeed a niche market, but one that is slowly and steadily growing. “We’re certainly affected by housing market trends, but not as severely as one might think. Our customers either want or require our products for what they are, regardless of what’s going on in new home construction or remodeling.” He also emphasized the highly localized nature of their sales. “Most of our business comes our way via word of mouth, or as repeat business. Our Internet presence likewise attracts many new customers looking for green building supplies, many of which are in-state.” The Center for Green Building’s website includes a complete catalog of their inventory for online or telephone orders. These products can ship pretty much anywhere. I asked Gabriel what his top three selling green building products were. He told me insulation was the big one. Followed by coatings/adhesives/sealers, and then flooring. The Center for Green Building is a distributor of UltraTouch Denim Insulation, by Bonded Logic. Many readers of this forum are well aware of the difficulties (and controversies) associated with achieving Grade I installations of fiberglass batts. And the environmentally conscious are likewise concerned about both the energy consumption and chemical agents required in their manufacture. So a number of alternative batt insulation products have come to market, including UltraTouch, as well as mineral wool ComfortBatts by Roxul. What’s nice about these alternative batts is that they’re reasonable rigid, and can easily be cut and fitted into stud or joist bays, and scribed around penetrations. 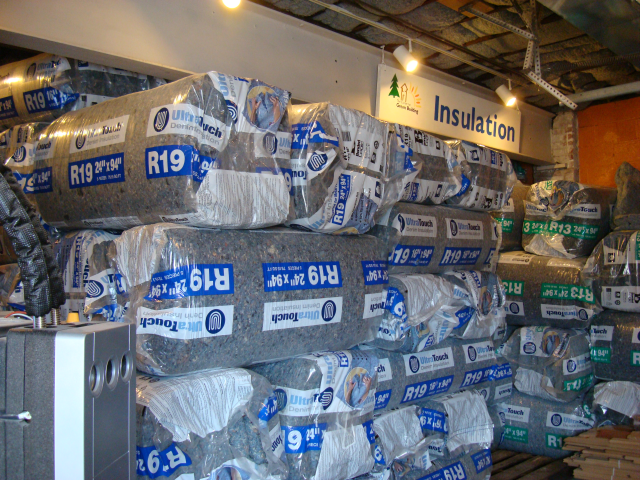 UltraTouch denim batt insulation inventoried at The Center for Green Building. The UtraTouch batts, manufactured from recycled post-consumer denim and cotton products, have an R-value comparable to fiberglass. Also treated with a flame retardant boron-based compound, makes them a Class A building material. They contain no VOCs and are safe to handle directly. I asked Gabriel about moisture and mold issues, given the cotton nature of the batts. He told me the boron treatment inhibits mold growth, plus the batts naturally breath, and can usually expel moisture over time if they get slightly damp. 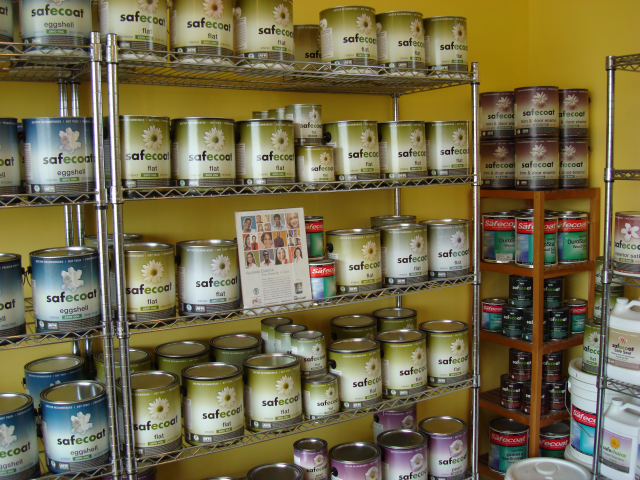 Shelves of Safecoat paints, stains, and primers; highly recommended and sold by The Center for Green Building. Finally, regarding flooring, sustainable wood flooring from Eco Timber is an extremely popular product of theirs. “Their wood flooring products are all Forest Stewardship Council (FSC)-certified, meaning that they come from carefully and sustainably managed forests. The FSC certification also qualifies them for use in LEED green building projects”, Gabriel said. 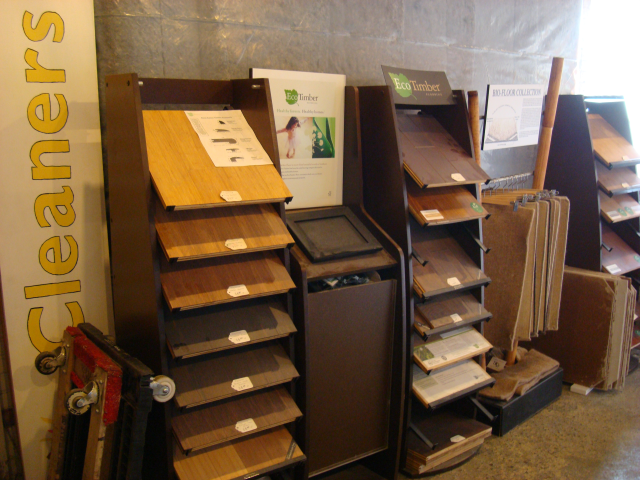 The Center for Green Building maintains a full collection of samples of Eco Timber flooring. Understandably special-orders flooring based on their customers’ project specs. These then directly ship to the job site. One of the most admirable things I discovered during my visit at The Center for Green Building was the extent to which the owners completely live their own green building/remodeling philosophy. Their store, for example, is a former automotive shop. They completely refurbished it themselves. They even used the very same products they sell, including the UltraTouch denim insulation and Safecoat paints. A small, high efficiency heating system keeps their place warm (more accurately, “cool”, according to Gabriel) in winter. It is augmented by a small solar collector on the roof. The Center for Green Building store showcases its owners’ green building philosophy, as well as the products they sell. 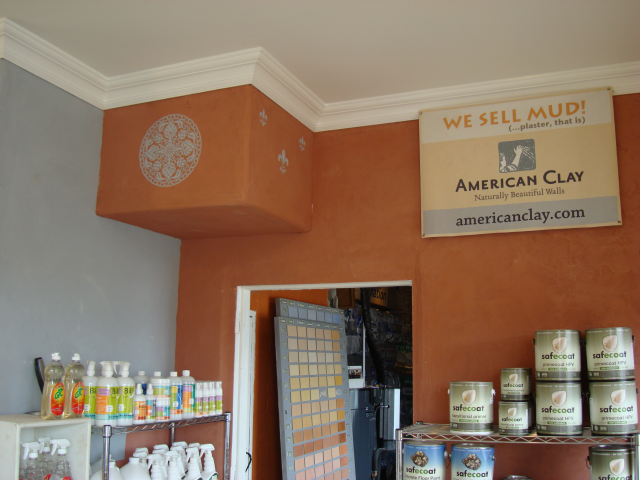 Another green building product I like is American Clay’s environmentally-friendly plasters. Here, The Center for Green Building owners used it to beautifully finish a partition wall between their office and main stock room. So, if you happen to find yourself in the vicinity of Fairfield County, Connecticut, and have an interest in green building and renovation, please consider visiting the fine folks at The Center for Green Building. Learn more about their products, green building philosophy, and experiences in using the very same products they sell. Also, please visit and “like” their Facebook page, as well. Many thanks to them for researching, using, promoting, and making available to others, the best possible non-toxic and sustainable building supplies around. We all need to do our part to combat environmental damage and climate change. All this while still ensuring the safety and health of building occupants. And The Center for Green Building is clearly leading by example on all fronts. I have a question for John (seriously) – what is your opinion of milk paints? I have seen these before and they sound appealing, but do you find them to be a good product? Thanks. Hello Alexandra. I actually haven’t tried any of the milk (whey-based) paints yet, but I’ve seen them used to achieve pretty good results, especially when putting distressed finishes on antique or reproduction furniture. I plan to experiment with them at some point soon, so will let you know what I think of them in time. Like the Safecoat paints, milk paints are totally VOC-free, and hence non-toxic to occupants and the environment alike (always a good thing! ).